We planned and carried out a tour called The Origin of Co-operative Tour to visit and study the origin and development of co-ops in the world in 15-22 September 2013. In this trip, we visited Manchester and Rochdale in UK and Bologna in Italy. There were 9 participants, namely the General Director & CEO of NFUCA, student director, and young managing directors from several university co-ops. We went to The Co-operative College in the UK to learn about the ethical philosophy of co-op and the management of cooperatives which are getting support from consumers. As an educational charity, the College has its mission of “Putting education at the heart of co-operation and co-operation at the heart of education.” It was established in 1919 and offers a variety of curriculum to support the development of a successful and diverse co-operative sector. 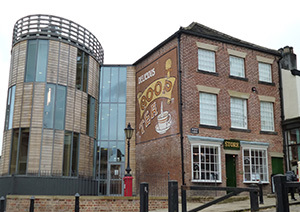 The College also manages Rochdale Pioneers Museum and is working on a project called the arcHive project that aims to develop new resources exploring various themes in co-operative history. The changes on education policy took place in 2006 in the UK. Schools became more independent and more and more schools took co-op form. The practice first began with secondary schools as pilot experiment, which will be followed by high schools and universities in the future. We also visited Rochdale, the birthplace of co-operative movement. 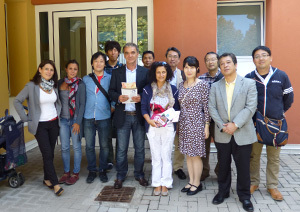 The Origin of Co-operative Tour also visited Bologna. We attended a lecture given by a professor of Faculty of Economics, University of Bologna. Since Bologna was an independent city-state during the Middle Age, it has a characteristic as a region where people are used to create association, which makes it easy for co-operative movement to develop. The Italian Constitution (1947) gives formal recognition to the role of cooperatives in Article 45. The law promotes and favors the growth of co-operatives. We also visited Legacoop Bologna. Legacoop is a co-operative federation which consists of several associations of cooperatives. We also visited Legacoopsociali in Bologna, an association that organizes and represents the social cooperatives. In Legacoop we learned about co-op model contest that targets high school students, in cooperation with local companies and government. We also visited Cadiai, a social co-op. Cadiai provides social, healthcare, and educational services to the elderly, children and the physically challenged. Although there are opportunities for new providers to work on this sector due to the public offering, almost all care-related services are done by social cooperative. We can say that this type of social co-op has won the trust of government and community.